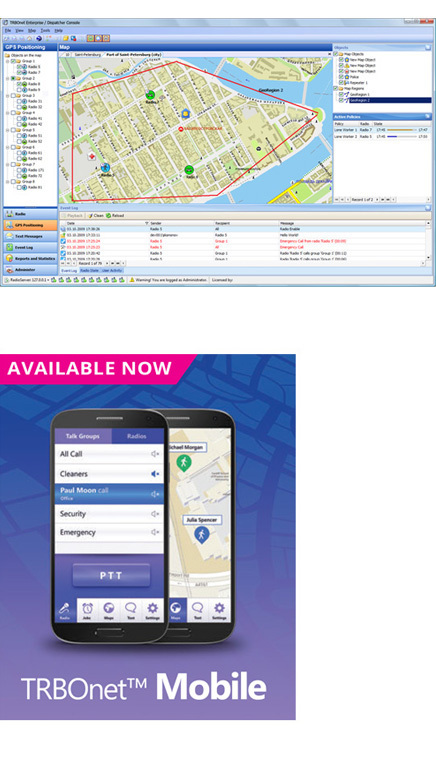 TRBOnet is a professional grade application especially developed for Dispatch centres that monitor large amounts of traffic. It supports digital as well as analog channels that could be helpful for clients during their migration period. Also makes response during emergency situations quick and effective, and can be used to link multiple agencies or departments at the touch of a button by the dispatcher. TRBOnet Enterprise is a powerful control room solution designed to work with MOTOTRBO networks of any size and complexity. This IP-based dispatch system offers a wide choice of additional modules, which means that it can be tailored to your individual requirements. All type of calls Intercom Cross mute Prerecorded messages. All voice calls Playback interface Built-in converter External storage. All system events Advanced filters Notifications Instant playback. Private and group Predefined messages Scheduled messages Text to speech. Real-time GPS GPS history & playback Geofencing Custom maps. MOTOTRBO and TRBOnet open new ways. This video describes how you can improve you radio communications. MOTOTRBO provides you with all type of calls : broadcast, personal, group, emergency and remote monitor. TRBOnet Enterprise is a professional grade application especially developed for Dispatch centers that monitor large amounts of traffic. It supports digital as well as analog channels that could be helpful for clients during there migration period. Also makes response during emergency situations quick and effective, and can be used to link multiple agencies or departments at the touch of a button by the dispatcher. TRBOnet Enterprise is the best for MOTOTRBO Capacity Plus, IP SITE CONNECT and CONNECT PLUS.